There's a great amount of roots rock coming from the great Brit isles right now. 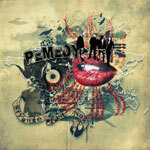 UK based Remedy is another with heart and soul deep in classic rock and blues from our timeless yesteryears. Their six song EP, 'Strange Fast Now,' is a good introduction to their bluesy brand of hard rock, displaying their skill and enthusiasm. However, if you do not listen through this album from beginning to end you will miss Remedy's talent and strength. In other words, if you can overcome the slow and mundane start, you will find some gems here. Dismissing the first two tracks, my interest began to peak with 'Learn To Speak' thanks only to the interesting fret work. From here my attention expanded slowly. What follows is increasingly creative. But again, 'Priests & Preachers' and the true highlight 'Sacred Deep Inside' only display the excellent guitar work and steady rhythm section. My major consternation and conundrum was with Jenn Cherene's vocals. Honestly, she's really quite good, full of passion and honesty. She conjures the ghost of Pat Benatar mixed with the less drug-infested Janis Joplin. However, when she extends herself she loses clarity becoming the worst of modern screamo vocals. Additionally, this recording is hampered by poor production; it sounds crisp, but is actually tinny all the same. It sounds like they recorded this music in a maudlin bar in the morning before it opened (with a shot, a beer, and and egg and onion sandwich). If they were hung over from last night's gig, it may have been worse! What Remedy has is talent and enthusiasm (and awesome album artwork). What they need is objective direction from a good producer and engineer. 'Strange Fast Now' has all the fundamentals of great melodic hard rock with a bluesy edge, and with guidance they will go far.